I’d heard about it, read about it, even saw it mentioned on a TV show but nothing quite prepared me for the silly shock of being asked for the first time if I wanted to have some bunny chow for dinner. I was in South Africa, Durban to be exact, the great seaside melting pot where Gandhi once lived and today is home to the world’s largest Indian community outside of India. It was hot and muggy, just like every night in the southern city that is known domestically as a fun, beachy escape. That evening wasn’t about the water, sand or even the weather though. 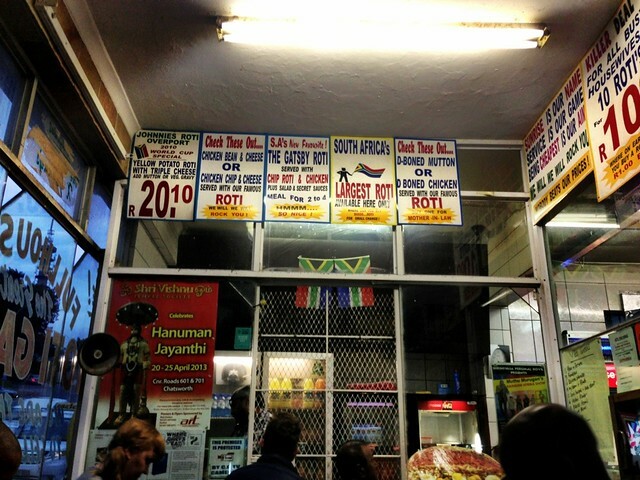 It was about another kind of heat, the slow burn for which Durban cuisine is so well known. The exterior of the Sunrise Chip N Ranch looked like an old carnival that used to roam the countryside. 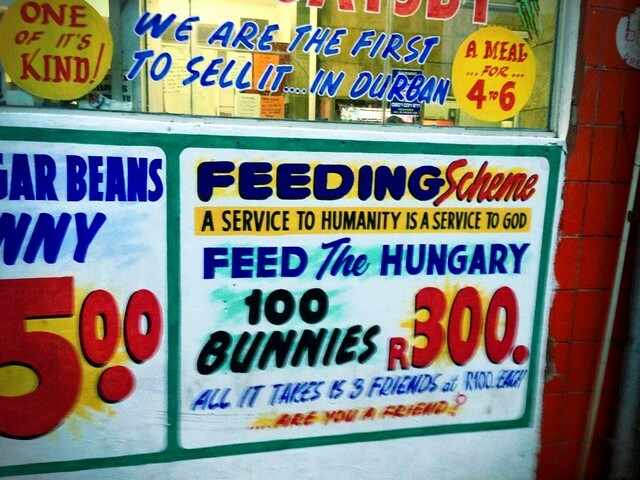 Signs proclaiming everything from “A Service to humanity is a Service to God” to the amazing deal of “100 bunnies for only 300 Rand” covered the shop inside and out. Thank God I was there with some Durban locals, pros at the fine art of ordering a bunny chow (or bunny) without looking like a complete idiot. The process was a lot like the Soup Nazi in Seinfeld and I’m positive I would have been told “No bunny for you!” had I attempted without the slightest bit of priming. So what is this bunny chow of which I speak? Like great street food, it’s pretty simple. 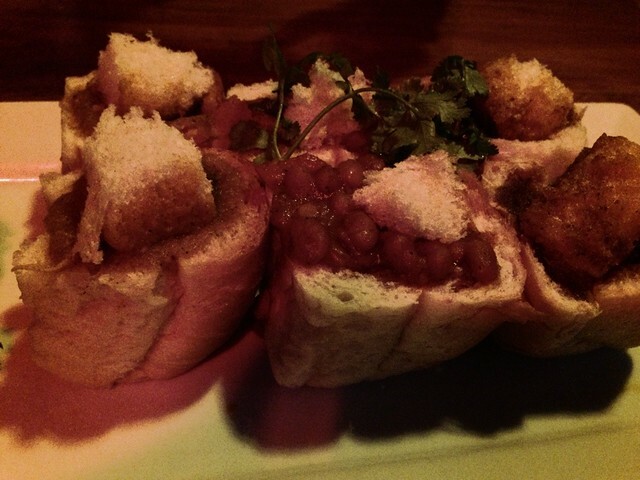 Bunny chow is a hollowed out loaf of bread that is then stuffed with curry. How it started is open to some dispute, but what does seem certain is that it was (and is) a workingman’s food. The large Indian community needed something cheap and easy to eat on the way to work, and bunny chow was the answer. While roti bread would normally be the traditional favorite, it has a tendency to fall apart and that’s why the loaf of bread became a staple. The word bunny comes from Banias, an Indian caste living in South Africa. Bunny chow is still a working person’s food; a healthy (and by healthy I mean enormous) portion costs around $1US. But it has also transcended its simple beginnings and high-end bunnies can be found gracing the menus of restaurants throughout Durban and South Africa. 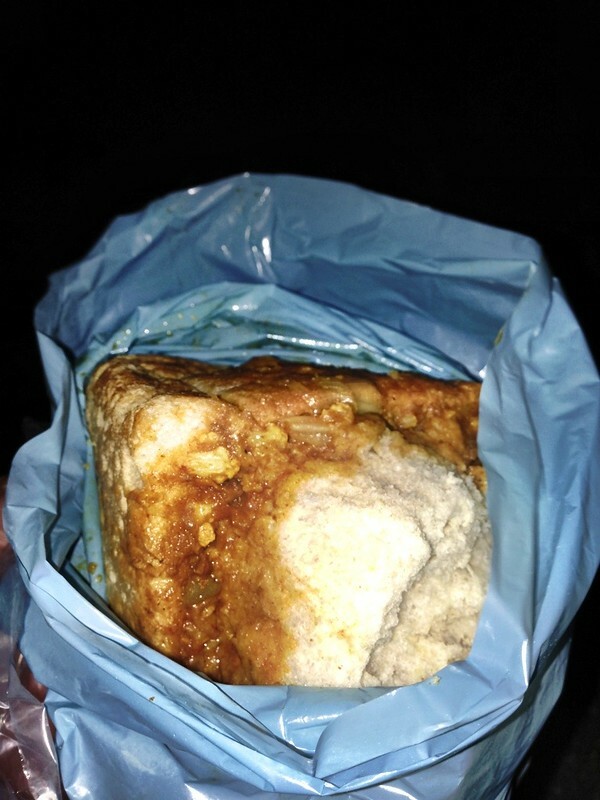 But for the real, honest-to-goodness bunny chow experience there’s nothing like ordering a portion of this spicy meal from a hole in the wall take-away shop on the streets of Durban. Like most great, iconic foods the experience of eating it is as good as the food itself, and another great way of learning about the dynamic country of South Africa. This campaign is brought to you by the South African Tourism board and is supported and managed by iambassador. LandLopers.com maintains full editorial control of the content published on this site.